Something very different is happening this year at PMEA. Something very different indeed! This year, I am very excited to have a number of Music Education majors from Grove City College actively engaged in broadcasting their thoughts and insights from PMEA through the use of Social Media. I’ve been incorporating Web 2.0, such as blogging, Twitter and other Social Media forms, into much of “technology-side” of my teaching endeavors at GCC since 2005. This year, I have a number of under-graduate students that have taken some of my concepts along with some of their-own and have merged them together. This merging has lead to the idea to “Live Blog” many of the clinics that they will personally be attending at this year’s PMEA conference. This idea will be made manifest next week at the 2011 PMEA state conference in Hershey, PA.
To this end, a brilliant, yet rag-tag group of upperclassmen undergraduates from Grove City will be coordinating efforts through, fellow-classmate, Andrew Ritenour’s Website: FutureMusicEducators.net. 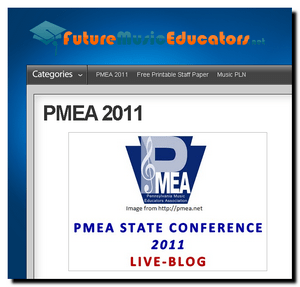 He has created a PMEA 2011 Live-Blog Landing Page where anyone may follow the journalistic endeavors of “the five” of them while attending the music conference, or because of the viral nature of the journaling, it can be followed while anywhere in the world! I’ve used CoverItLive here on MusTech.net a number of times. It is a great social media platform for collaborating and sharing ideas at these conference type of events. Andy Zweibel of MusicEdMajor.net has also used CoverItLive for collaborating and sharing information from music conferences as part of his music collaborative efforts as well. I encourage anyone interested in this to take the time to visit the previous two links embedded in this paragraph to experience an archived version of a CoverItLive session. CoverItLive comes in various “packages”, but anyone can get started with the basic version for free. Our students’ efforts will be quite focused around the educational experience of live-journaling (live-blogging) their selected clinics while attending the various sessions at the PMEA 2011 conference. The educational capital gained by doing something like this is greatly expanded beyond the content that each clinician is brining to his or her own session. The students will be able to crystalize their own thoughts through the journaling process, learn to better implement cutting-edge social technologies, as well as to socially learn, collaborate, and network with others through the use of the extensive and viral Social Media forms they are utilizing. Andrew Ritenour is a junior Music Education major at Grove City College in Grove City, PA. He is actively involved in many performing ensembles including brass quintets, concert bands, marching bands, and choirs. Andy plays Tuba and Euphonium and is the Brass/Marching Instructor for the Somerset Area HS Marching Band. You can find him on twitter at @andrewritenour or atAndrewRitenour.Com!. Elizabeth Heist is a senior music education major at Grove City College Grove City, PA. She is actively involved in many performance ensembles including brass and woodwind quintets, French Horn ensemble, choir, and marching and concert bands. Elizabeth plays the French Horn and is a marching and brass instructor for the Somerset High School Marching Band. You can find her on Twitter (@heistes) or at www.elizabethheist.wordpress.com. Emily Farrell is a junior music education major at Grove City College in Grove City, PA. Her major is percussion with a minor in voice. Emily is involved with several performance ensembles including percussion ensemble, concert and marching band, and several choirs. You can follow her on Twitter at @emilyrfarrellor at her blog, http://waitingforastory.wordpress.com! Brittany Bell is a junior Music Education (voice) major at Grove City College. She as been involved with chapel choir, pops choir, opera workshop, jazz ensembles, marching and concert band, and orchestra, and has also done technical theater work. You can find her on Twitter at @brittany_bell, at her blog site,http://adventuresinmusicland.wordpress.com, or MusicPLN.org. Ryan Dore is a junior Music Education major at Grove City College in Grove City, Pa. He is currently studying applied trumpet with Drew Fennell and is actively involved in the Grove City Jazz Ensemble, Wind Ensemble, Concert and Marching Band as well as several small choral and instrumental ensembles. You can follow Ryan on Twitter at @britishbuegler, on the MusicPLN.org (Dorerj15), or at his blog – http://ryanjdore.wordpress.com. Again, we are encouraging all PMEA 2011 attendees to use the Twitter hashtag that we have selected to implement for the PMEA event, #PMEA11, so that we can all share information that we find valuable at the conference and to network with each other. Below is a “window” into our activity at the event (Note the Twitter widget will not be showing anything past May, 2011). In addition to Live-Blogging the various clinics, they will be using Q3-HD video cams to record many of their “escapades” at the event itself… I look forward to seeing these and bringing them to you all! I am very much looking forward to the “fruits of our labor” with this project and encourage as many of you that are attending and/or those that read MusTech.net or participate in our Twitter/Facebook PLNs or the MusicPLN.org to join us in this very Web 2.0 PMEA 2011 experience!